The Burren in County Clare is unique landscape of huge pavements of limestone called 'clints' with vertical fissures in the called 'grikes'. The Burren is famous for its limestone loving plants such as foxgloves. Many orchid species flourish in the Burren The first of these to flower each spring are the early purple orchid and the dense-flowered orchid. Other orchid species here include fly orchid, bee orchid and butterfly orchid. Poulnabrone dolmen is a portal tomb in the Burren, County Clare, Ireland, dating back to the Neolithic period, probably between 4200 BC and 2900 BC. Excavations in the 1980's found that up to 22 adults and 6 children were buried under the monument. Personal items buried with the dead included a polished stone axe, a bone pendant, quartz crystals, weapons and pottery. With its dominating presence on the limestone landscape of the Burren, the dolmen was probably a centre for ceremony and ritual. Pick up from your accommodation in the Dublin area. 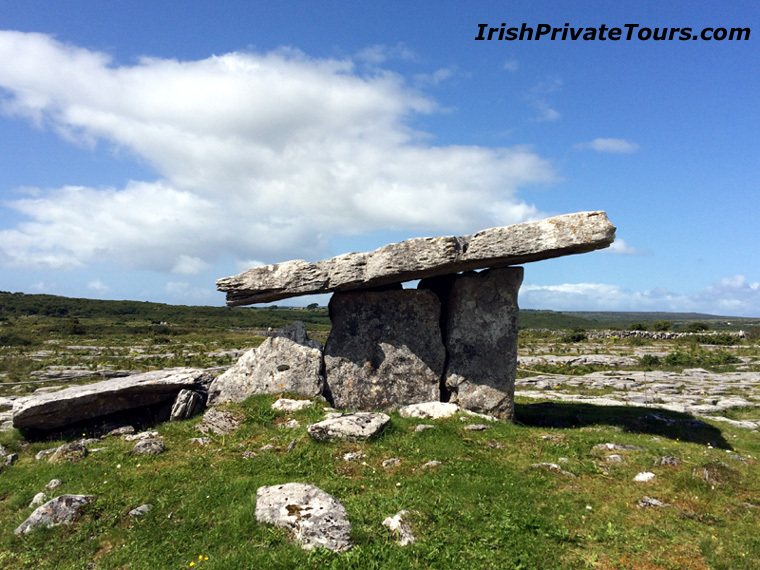 The iconic Poulnabrone dolmen (photo above) in the heart of the Burren. The world famous Cliffs of Moher with stunning views of the Atlantic Coast. A drive along the Galway Bay part of the Wild Atlantic Way. Return to your accommodation in Dublin.